Forever’s first exclusive beauty supplement helps you take control of the aging process. It's the perfect companion to firming serum by targeting aging from the inside out! 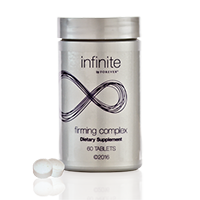 Two small uncoated tablets taken daily, support multiple internal body systems as well as your overall health and skin appearance. Backed by two clinical studies, French melon provides Superoxide Dismutase, a key player of the antioxidant system to help fight free radical stress. Patented phytoceramides taken from European wheat*, replenish a key component naturally found in the skin that plays a crucial role in moisture-barrier function to support skin hydration and anti-aging. Taking collagen orally has shown to reduce the appearance in the depth of facial wrinkles and increase skin’s bounce, flexibility and hydration. Finally, Vitamin C helps reduce tiredness and fatigue as well as contributes to normal collagen formation. This beauty from the inside approach is a revolutionary development in anti-aging and is what all other anti-aging systems are missing.